CES 2013: Archos announce 4 new tablets in the Titanium range! Archos already has a fair few tablets in their stables, but that's not deterring them from offering a couple more and why should it?! Pictured above are the four new tablets in the Titanium range and these have quite a fair bit in common with each other. They each have capacity IPS displays, Dual-core 1.6GHz processors with quad-core graphics, Android 4.1 Jelly Bean and they're all nicely wrapped in very nice aluminium cases! We're not sure of exact details on screen resolutions for the tablets except for the 97 Titanium HD, which comes packing a retina equalling screen with a resolution of 2048 x 1536! It's also worth bearing in mind that the name of each of these tablets denotes the screen size; for example the 70 Titanium is 7" and the 101 is 10.1". 70 Titanium: 119€, $119, £99. 80 Titanium: 169€, $169, £149. 101 Titanium: 199€, $199, £169. 97 Titanium HD: 249€, $249 and £199. So there's are very reasonably priced tablets indeed! We'll have to wait until we either get the device in out hands or see the first reviews to ultimately decide if they're worth your hard earned money! 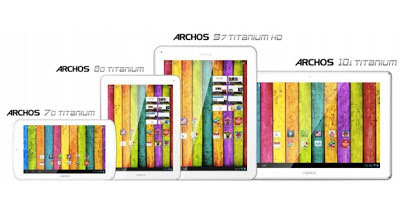 introduces the Titanium line in its Elements range of tablets. such as Amazon, at a better price point. user experience as the iPad mini, for a fraction of the price. than competition with comparable features. 249€, $249 and £199, and aims to be an alternative to the new iPad for half the price.